Kunstmatige zoetstoffen, zoals aspartaam, sucralose, saccharine, neotaam, advantaam en acesulfaam-K die veel als vervangers van suiker worden gebruikt in voeding en dranken blijken een schadelijke invloed te hebben op de darmflora. En daarmee indirect op onze weerstand. Dat blijkt uit een studie door wetenschappers uit Israel en Italie en Singapore en gepubliceerd in Science Daily. De ene zoetstof laat andere bacteriën oplichten dan een andere. Bovendien kon vastgesteld worden dat het toxische effect dosesafhankelijk is. “Dit is aanvullend bewijs dat de consumptie van kunstmatige zoetstoffen de microbiële activiteit nadelig beïnvloedt, hetgeen een groot aantal gezondheidsproblemen kan veroorzaken,” aldus een van de onderzoekers in ScienceDaily. Conclusie: The collaborative study indicated relative toxicity of six artificial sweeteners (aspartame, sucralose, saccharine, neotame, advantame, and acesulfame potassium-k) and 10 sport supplements containing these artificial sweeteners. The bacteria found in the digestive system became toxic when exposed to concentrations of only one mg./ml. of the artificial sweeteners. FDA, High-Intensity Sweeteners U.S. Food and Drug Administration. Available online: https://www.fda.gov/food/ingredientspackaginglabeling/foodadditivesingredients/ucm397716.htm (accessed on 19 May 2014). EFSA, Sugars and Sweeteners European Food Safety Authority. Available online: https://ec.europa.eu/jrc/en/health-knowledge-gateway/promotion-prevention/nutrition/sugars-sweeteners (accessed on 30 January 2018). DeNoon, D.J.R.b.C.G.M.M. Drink More Diet Soda, Gain More Weight? Overweight Risk Soars 41% with Each Daily Can of Diet Soft Drink. Web MD Medical News 2005. Available online: https://www.webmd.com/diet/news/20050613/drink-more-diet-soda-gain-more-weight#1 (accessed on 11 February 2011). Figure 1. Artificial sweeteners toxicity. 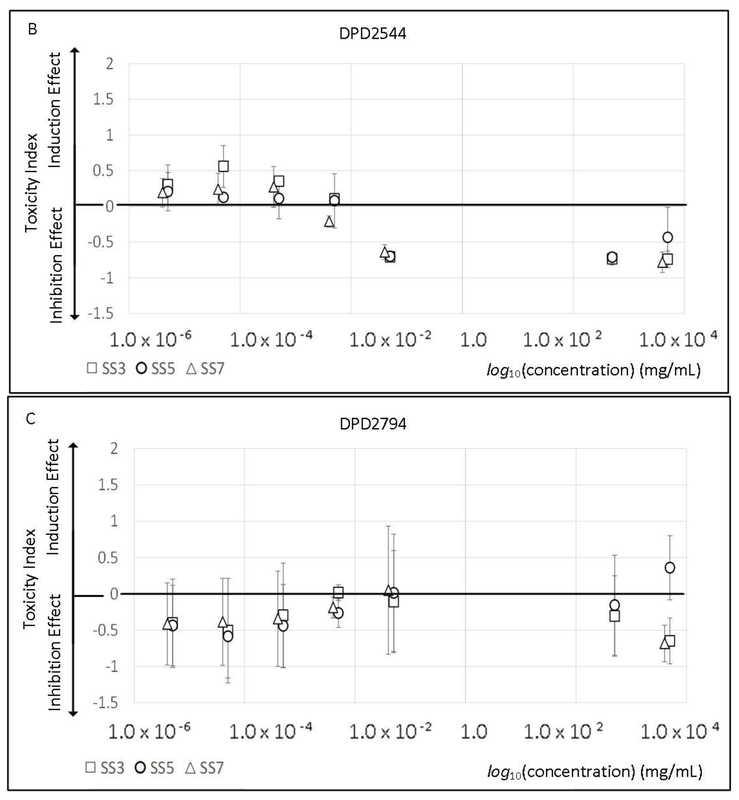 The toxicity index of different artificial sweeteners on the three tested bioluminescent bacteria strains: (A) TV1061; (B) DPD2544; (C) DPD2794. 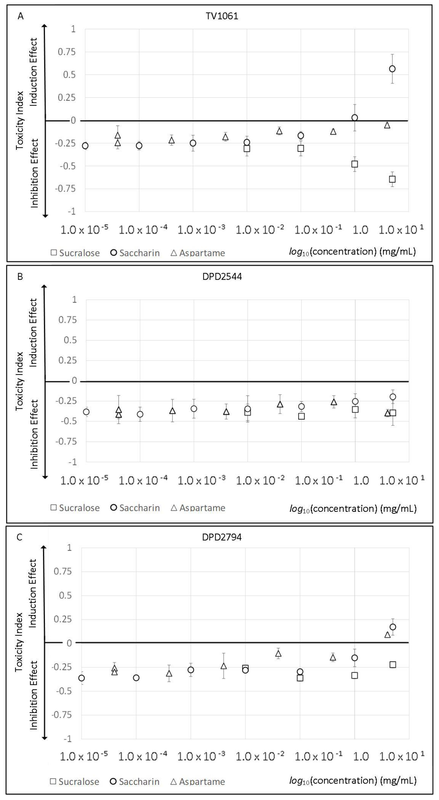 A strong induction response pattern may be observed in the response of the TV1061 strain to saccharin and DPD2794 strain to aspartame and saccharin. 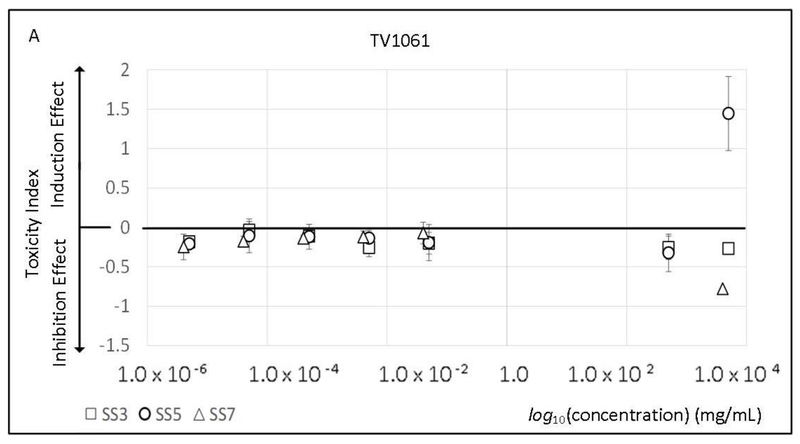 In addition, a strong inhibition response pattern may be observed in the response of the TV1061 strain to sucralose. Figure 2. Sport supplements’ toxicity. Toxicity index of different sport supplements on the three tested bioluminescent bacteria strains: (A) TV1061; (B) DPD2544; (C) DPD2794. Figure 3. Experimental process. 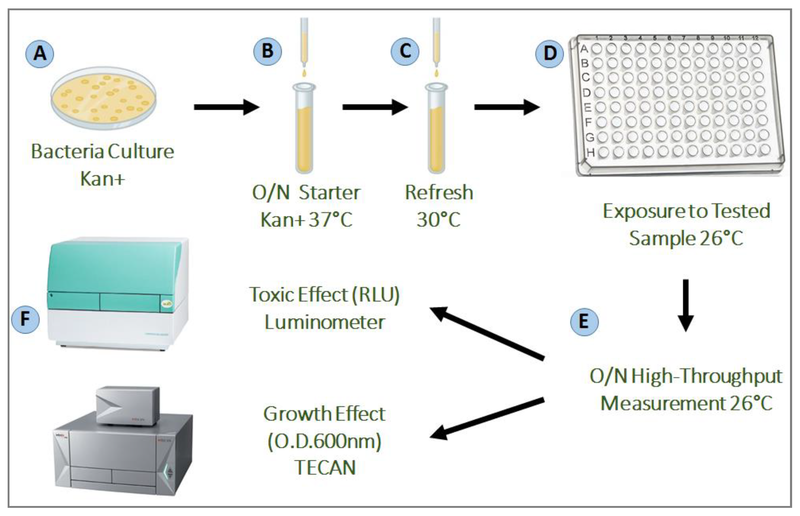 (A) each bacteria strain tested was striked on an agar plate containing Kanamycin, and incubated overnight at 37 °C; (B) a starter was grown from a single colony from the striked plate, and incubated overnight at 37 °C in a shaking incubator; (C) the starter was refreshed by adding 200 μL of the overnight culture into 10 mL of fresh LB, and then grown for 3–4 h at 30 °C in a non-shaking incubator; (D) the bacteria strains were then exposed to the different samples of different concentrations in a high-throughput measurement using a 96-well plate; (E,F) the toxicity (Relative Light Unit (RLU)) and growth (O.D. 600 nm) signals were measured continuously during the 16 h incubation at 26 °C, in the Luminometer and TECAN reader, respectively. Table 1. Artificial sweeteners toxicity and viability effect (mg/mL). Aspartame TV1061 N.E. N.E. N.E. N.E. DPD2544 N.E. N.E. N.E. N.E. DPD2794 N.E. 4 N.E. N.E. Sucralose TV1061 1 N.E. 50 N.E. DPD2544 50 N.E. 50 N.E. DPD2794 100 N.E. 50 N.E. Saccharin TV1061 N.E. 5 5 N.E. DPD2794 N.E. 5 N.E. N.E. DPD2794 N.E. N.E. N.E. N.E. Neotame TV1061 N.E. 2 N.E. N.E. DPD2544 2 N.E. N.E. N.E. Ace-K TV1061 N.E. N.E. N.E. N.E. DPD2794 N.E. 10 N.E. N.E. MLIC—Minimum Luminescent Inhibition Concentration; MLIndC—Minimum Luminescent Induction Concentration; MGIC—Minimum Growth Inhibition Concentration; MGIndC—Minimum Growth Induction Concentration; N.E.—No Effect. Table 2. Sport supplements’ toxicity and viability effect (µg/mL). SS1 TV1061 N.E. 2000 N.E. N.E. DPD2544 2 × 10−3 2 × 10−6 N.E. N.E. DPD2794 N.E. N.E. 2000 N.E. SS2 TV1061 N.E. N.E. N.E. N.E. DPD2544 1 × 10−3 1 × 10−6 N.E. N.E. DPD2794 N.E. N.E. 1000 N.E. DPD2544 4 × 10−3 4 × 10−6 N.E. N.E. DPD2544 5 × 10−3 5 × 10−6 N.E. N.E. SS5 TV1061 N.E. 5000 N.E. N.E. DPD2794 N.E. 5000 5000 N.E. DPD2544 3 × 10−3 3 × 10−6 N.E. N.E. SS7 TV1061 5000 500 5000 N.E. DPD2794 5000 N.E. 5000 N.E. SS9 TV1061 N.E. 3000 N.E. N.E. Table 3. Sport supplement profile. Table 4. Bioluminescent bacterial strains. 1 Reactie op "Zijn zoetstoffen schadelijk voor de gezondheid van de mens? Nieuw onderzoek ziet aantasting van darmflora door bepaalde zoetstoffen." Sinds mijn expat ervaring in China (1992)gebruik ik uitsluitend Stevia. In de EU was import en gebruik van Stevia verboden ?